Learn how to awaken to higher consciousness NOW so that you can experience conscious dying at the end of your life. In this episode I share the secret behind the 3-part tagline I use on the EOL University website and at the end of every podcast. (If you listen regularly you’ll know exactly what I’m talking about!) I discuss the wisdom behind the phrases I repeat each week and how they represent keys to our ongoing spiritual evolution! Check out my author/speaker website here. My long-awaited trip to Italy begins tomorrow, the day after the original airing of this podcast! You can follow my journey on Instagram and Facebook as I hike, bike, eat, drink, pray, and write my way through the country–all in search of the perfect stories for my new book on grief! I’ve pre-recorded enough podcast episodes to last until I return in one month–“see” you then! I would like to send a HUGE THANK YOU to my latest supporter on Patreon.com/eolu: Rich Hayes, who is a hospice chaplain. Check out his website at www.richhayes.com and his book God Made Simple. If you would like to join the list of patrons go to Patreon.com/eolu to learn more and chip in $1 or $2 per month to support this podcast and the EOLU Interview Series. You’ll receive a thank-you on this podcast and I’ll also promote your end-of-life related book, website, cause or business. PLUS you’ll receive the monthly Hospice Happy Hour Q&A recordings! In order to die consciously you must first begin to LIVE consciously right now. Here are my 3 tips for awakening to higher consciousness–they have been hiding all along in the simple tagline I use at the end of every podcast! Now you’ll find out what I mean when I remind you of them every week! You must go through your fear in order to rise above it; the more you hide and run away from your fear of death (which is the ultimate fear) you run away from joy, as well. So begin to accept that Death is inevitable–everything in the Universe dies–and life is full of difficulties. Once you embrace that fact you can begin to work specifically on your fear of death and turn it into acceptance. Think about death every day. Include contemplation of death as part of your daily practice; get used to the idea that life is fleeting and you don’t know when it will come to an end. Read about death. Find books (e.g. 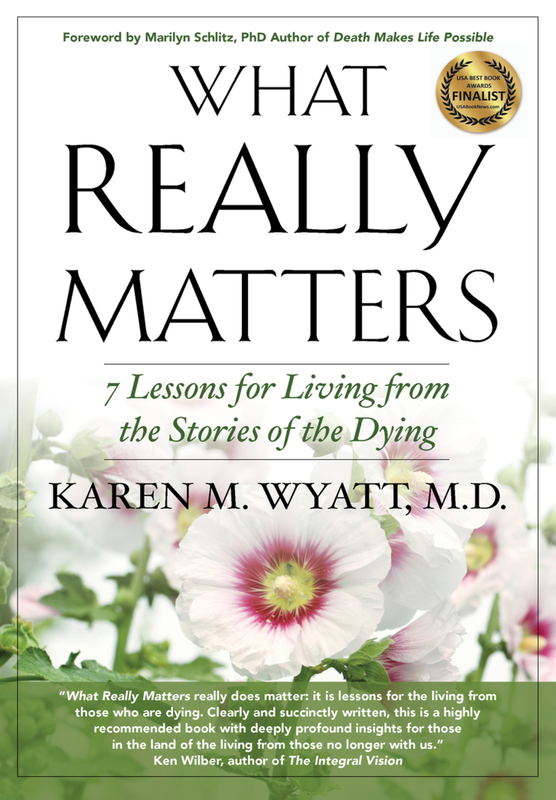 What Really Matters) and stories that portray death and dying in a meaningful way to help you see that it is not necessarily something to fear. The dying process can be a beautiful time of healing for patients and families. Learn about death. The more information you have about the end of life, the more your fears will lessen. Knowledge is one of the most powerful antidotes to fear. Tune in to the interviews on End-of-Life University for an ongoing education about all aspects of the end of life. Talk about death. Get comfortable including death and dying in your everyday conversations. You’ll find yourself better able to comfort friends and co-workers when they have experienced a loss and you’ll be helping others to tell their stories too. Work with death. Consider volunteering for hospice to learn how to sit with death and witness the dying process. Hospitals and nursing homes are also good places to volunteer to get closer to death and overcome your fear. Know what really matters to you. Spend some time thinking about what in your life is most important and prioritize those items. You need to know what you value in order to make tough decisions in the future. Make choices for what you want at the end of life. Use a tool like the Conversation Project Starter Kit to help you decide what type of healthcare you would like to receive in your last days. Complete your paperwork. You need to appoint a healthcare proxy and fill out an advance directive form in order to give your wishes some legal clout. But you also need to talk to your loved ones and your doctors about your wishes so they will know how to care for you if you can’t speak for yourself. Tend to your relationships. Learn how to forgive NOW so that you won’t be rushing to complete this important task while on your deathbed. Remember to say “I love you” to those who matter to you whenever you have an opportunity. Learn to BE in the present moment. Let go of ruminating about the past and worrying about the future–love and joy exist right here, right now in this present moment. Live according to what really matters to you. Let you values guide your choices each day and put your time and energy into the things that are most important. Practice gratitude each day. Keep a journal and begin by writing down one thing you are grateful for each night before you go to sleep. Even in the worst of times you will be able to think of one thing to be thankful for–you just have to shift your mindset to a more positive focus. Learn to find love in every situation. After you have developed a gratitude practice you will begin to notice that love is actually present everywhere, in everything that happens. Start focusing on the love and you will find it more and more frequently. Allow love to fill you. You can become a channel for love to the rest of the world by simply letting love into your life in every possible way. Fill yourself with love so you can share it with others. Life is an ongoing learning process! No lesson comes easily or without a certain amount of pain, but it’s worth it. If you begin conscious now and begin to live a life of love, then you will remain conscious when it becomes your time to die. You will continue to radiate beauty and joy to those around you–I’ve seen it happen over and over again! Keep tuning in each Monday for a new episode and if you enjoy this podcast please consider leaving a review on iTunes. Thank you!! Until the next time, remember ….